The prayer has many of the biblical truths of what it means to be a Christian - to seek to give, and in so doing, receive blessings; that the Lord's Prayer asks God to forgive us as we forgive, and that the goal of eternal life can only result from us putting to death our old sinful lives. ( ). Pointers for Prayer : Sometimes Christians are called to turn the world upside down. To bring the exact opposite of what we find in our world. 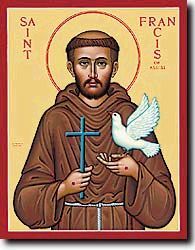 St. Francis' prayer is a bold one, asking for strength to give of ourselves to meet the needs of others. He recognises that it "is in giving that we receive", that as we give of ourselves, we receive the peace and blessing of our risen Lord Jesus. We cannot earn eternal life, but that we are pardoned from the sins that block our claim on it. Think about the situations that you are involved in that require peace, consolation, hope, light and joy. Then, if you're bold enough, pray the prayer!